Here's a superb online slots game on Wizard. 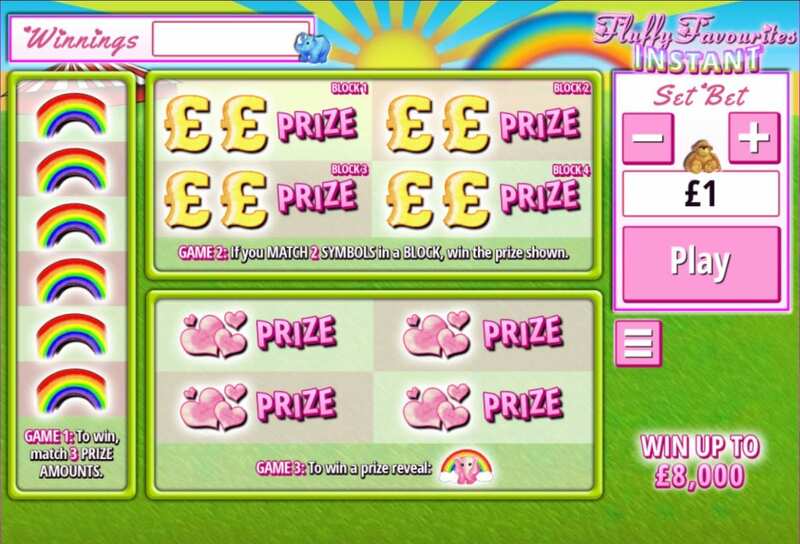 Fluffy Favourites Instant is an online Scratchcards game brought to you by the brilliant developers over at Eyecon. This drags you right back to your childhood, but for all the right reasons with a brilliant animal theme, where all the symbols being your favourite cutesy characters. You’ll be hoping to reveal some of them as you scratch your way to an epic cash prize on this online game. The chain of games under the Fluffy Favourites brand have all been hugely successful and we’re assured this one will be no different. So, jump in on this game now for hours on hours of fun and excitement. The bright colours of this instant win Scratch Card help to lighten up the mood. Whilst the graphics may not be as advanced as some of the more modern slots that’s exactly why it’s so loveable. Its simplicity and easiness on the eye is exactly what you need after a hard day, really helping you to relax into a fun few hours of gaming online. To get making some serious money with this thrilling game by Eyecon, you’ll first have to match the cuddly toy symbols. If you can manage to match up purple hippos you’ll have really hit the jackpot as they pay out the most, 5 of them can be 5000 times your original bet. Even the ducks and goldfish which are the lowest pay-out symbol can still give a very generous pay-out if you find 5 of them, which will be 100 times the original amount. There’s a range of different symbols to look out for including Dragons, Lions, Pandas, Turtles and more.